Nestled in valley of the spectacular Gypsum Hills is the historic town of Medicine Lodge, so name for the Indian council house once located on the legendary healing waters of the Medicine River. 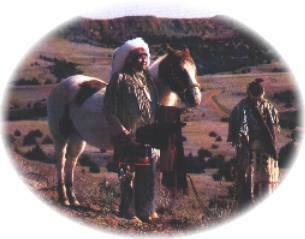 The town was the site of the signing of the historic Medicine Lodge Peace Treaty between the United States Government and the five tribes of Plains Indians - Kiowa, Comanche, Arapaho, Cheyenne, and Apache. A reproduction of the "medicine lodges" built by the Kiowa Indians can be found in the Stockade Museum located adjacent to the Carry Nation Home. Hundreds of people from across the country gather for three unforgettable weekends in May and September for trail rides, legends, scenic tours, western art, and rodeo. Every three years the spectacular 3 day reenactment of the Peace Treaty Pageant captivates the young and old. Come for a few hours or spend the rest of your life. You are always welcome in Medicine Lodge. Historic Grand HotelUp to a short time ago, this partially restored hotel featured restaurant facilities in the basement with an excellent decor and a supper club on the second floor. However, it is closed at the present time.